I think we could write a book about a seven week caravan. There are so many things to see, and do, and a lot happens to us and to our large group. A lot of what we think is interesting might not be for you. So we try to condense it for easier reading. 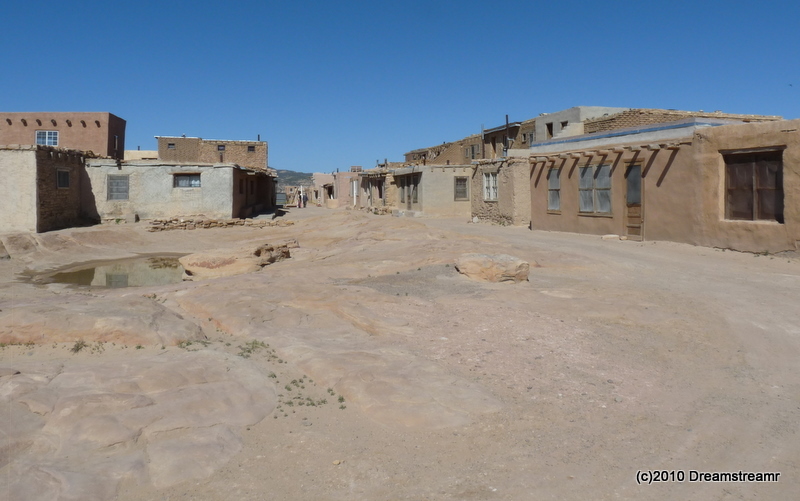 Acoma Pueblo, also known as Sky City Pueblo, is on a mesa over 350 feet above the desert. The Puebloans, after suffering years of attacks from marauding tribes, moved onto this very defendable site. It reportedly worked well against all except the Spanish conquistadores. Our guide treated us to a very informative walking tour of Acoma Pueblo. 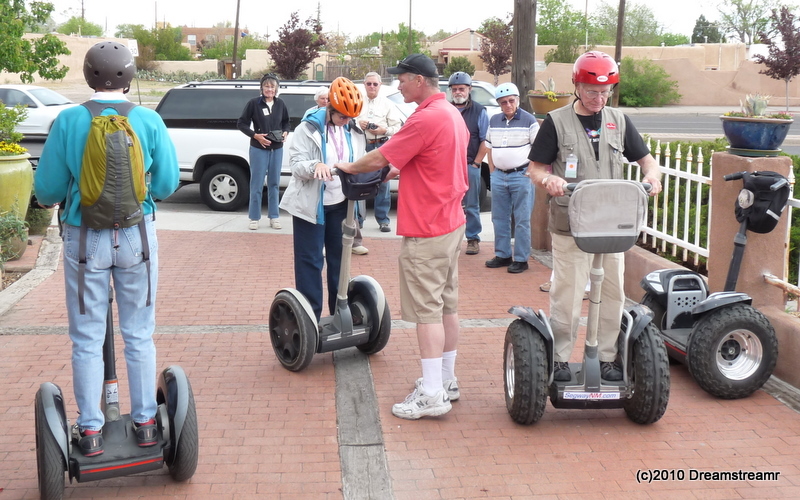 The Segway Tour of Old Town in Albuquerque was less a tour and more a lesson on riding Segways. We’re hooked on Segways, but for two concerns: they are still very expensive and we don’t have anywhere to stow them while we travel. This was a fun way for us to get our first glimpse at Old Town. The Segway guides, Sean and Sean, shepherded us across intersections and kept a watchful eye on our maneuvering. They didn’t provide us any narrative and so this did not, for us, replace walking about Old Town. 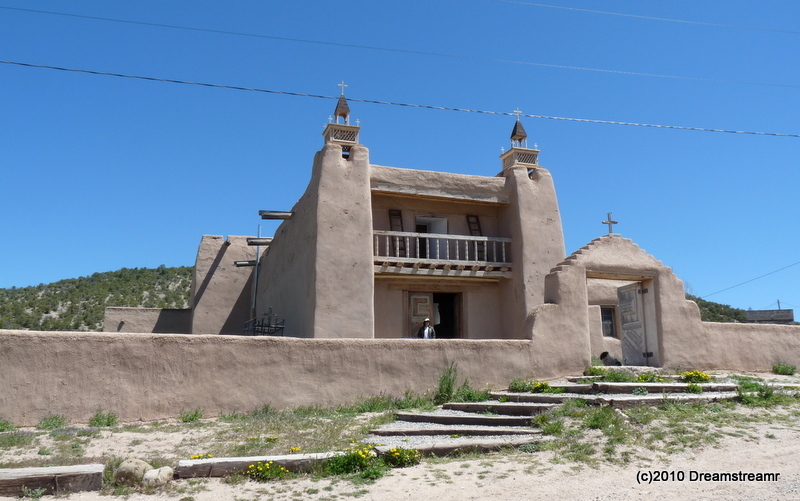 San Jose de las Gracias Church, Las Trampas, New Mexico is very old and seems authentic. The church was built in the 1700s and appears not to have changed since. The original wood planked floor is still in use, and many of the artifacts and icons are also very old. Did they do this without ladders, too? 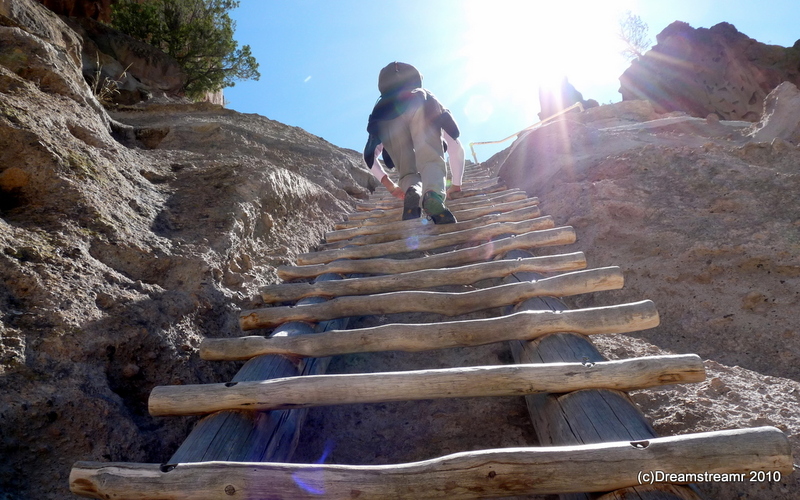 Bandelier National Monument includes a great hiking trail down to the Rio Grande River, cliff dwellings, petroglyphs and pictographs, and adobe villages with large kivas. We could have spent another day exploring and hiking this nice park. The hike through Frijoles Canyon to the river is worth doing again. How often do you meet a Train Tycoon? 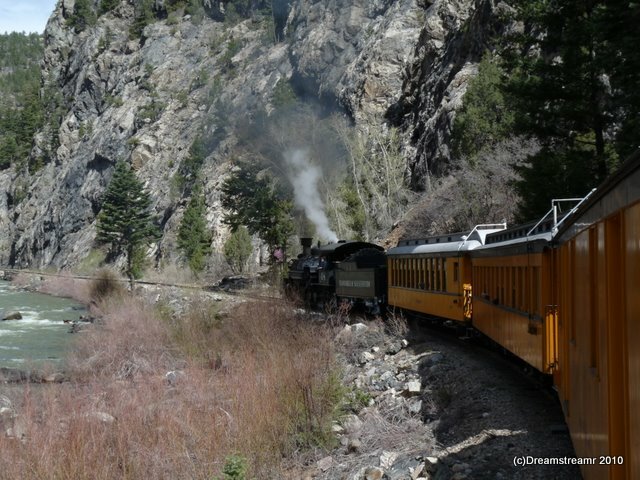 The Durango & Silverton Narrow Gauge Train ride is a real neat treat. We rode in open cars, the genuine article from 125 years ago, for a few hours from Durango to Silverton. Silverton, at around 9,000 feet elevation, was chilly and breezy as we walked around the small residential and business areas. We had a fine lunch in Pickle Barrel, perfect salad, and sweet potato and carrot soup, followed by the hugest chocolate cake (five layers, five pounds, just kidding). Great train ride, great lunch, great day. Canyon del Muerto, Chinle, AZ, is a beautiful place filled with sorrow. The name means Canyon of the Dead. The Spaniards, in the 1800s, trapped dozens of Navajo in the Canyon and killed them all. Ben and Adam Teller’s family business, Antelope House Tours, provided us a very good tour of Canyon del Muerto. The wash was full of water, the banks were steep, and our tour guide/driver Daniel did a fantastic job sharing the history and safely conducting us through the canyon in his Jeep Cherokee. 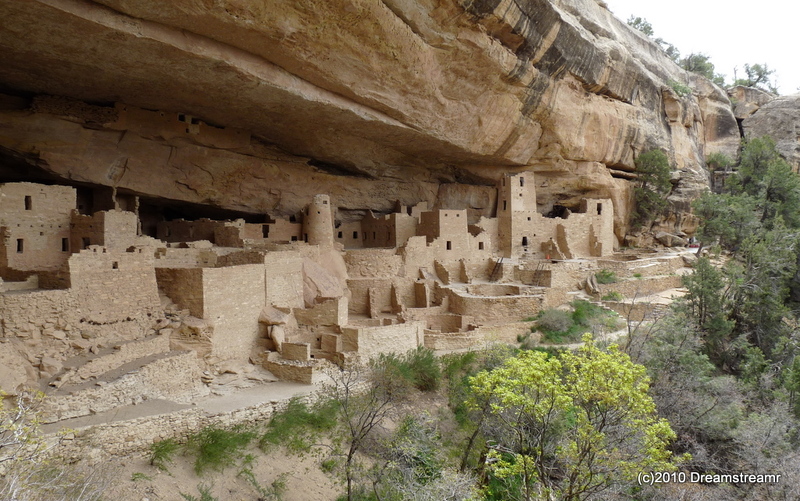 Cliff Palace at Mesa Verde, the largest cliff dwelling in North America, is a wonder of engineering and execution. It was built around 1200 AD and occupied only until approximately 1300 AD. Many of the walls are intact and the National Park Service attempts to stabilize them with minimal changes. We drove to Garden of the Gods via the Moki Dugway, an old uranium ore haul road from Cedar Mesa. 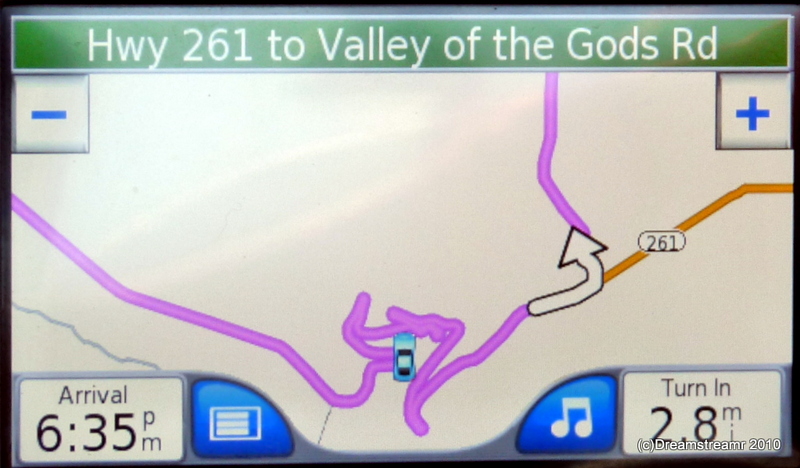 The GPS route map was pretty fantastic, until we realized the road really is arranged just as the GPS shows. 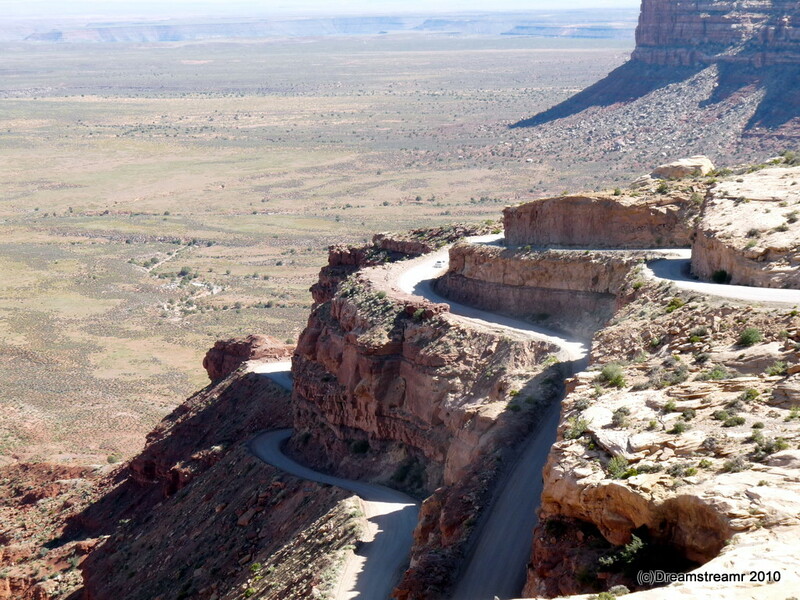 These two pictures depict the GPS image and the genuine Moki Dugway routes. 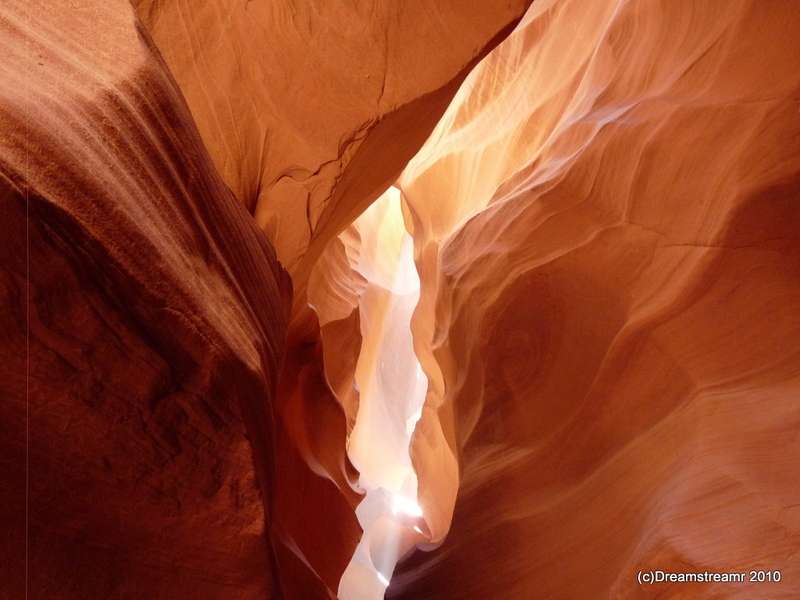 Antelope Canyon, near Page, AZ, provides a business opportunity for the Navajo Tribe. Since the Canyon is on Navajo lands the tour companies all must be Navajo. 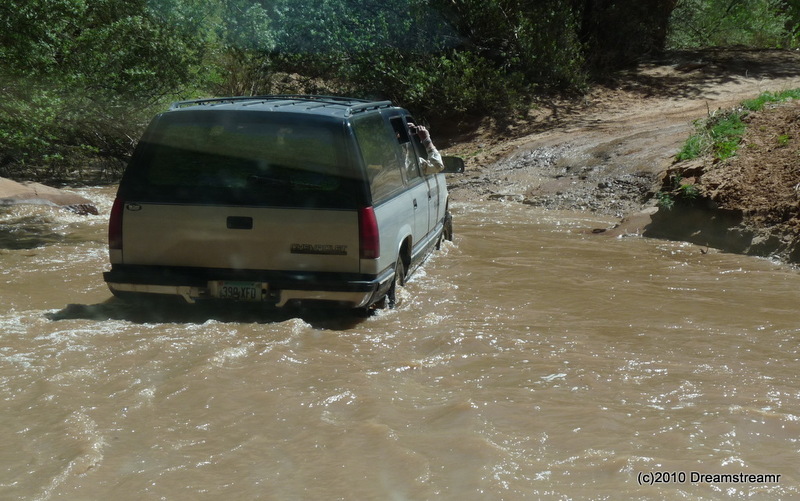 We met our tour in Page where we climbed high up onto the rear of a souped-up Chevy 2500 pickup with the hugest mudding tires you can imagine (our guide told us the tires list at $1,300 each). We cruised a few miles onto the reservation to the Canyon’s entrance and followed our guide inside. He showed us the best picture opportunities, capturing the sun’s rays piercing down through sifting sands from high above. Almost ruined our camera, exposing it to all the wind-blown and falling sands, but caught a few really pretty pictures in Antelope Canyon. 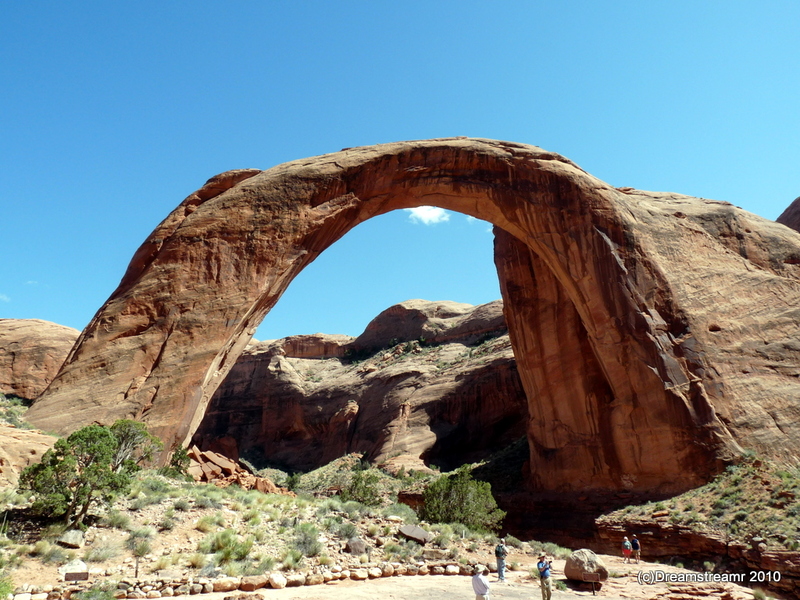 Rainbow Bridge National Monument is a very impressive structure and the boat ride there was nice. We got to see Lake Powell, a lot more of it than from anywhere else. The little canyon was interesting because it didn’t look like the boat was going to fit, it was a very narrow canyon. We thought we could have reached out from the boat and touched the canyon sides. 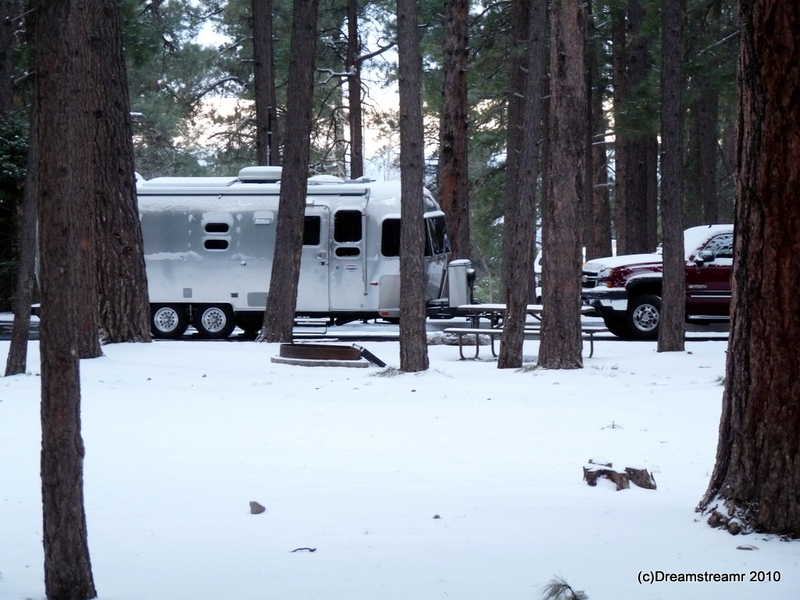 North Rim of the Grand Canyon, AZ, was one of our chilly stops. The snow started falling while we were asleep. We would have liked even chillier temperatures so the snow could stick around a couple of days, but it melted soon after sunrise. We hiked the Transept Trail from campground to the Grand Lodge, explored in and around the Grand Lodge a little, and visited several viewing lookouts including Cape Royal and Point Imperial. 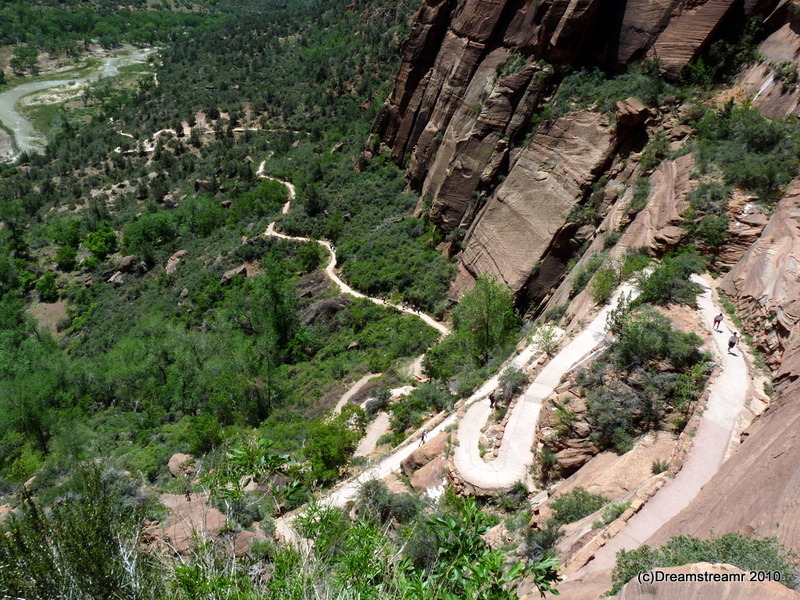 Zion National Park in Utah is one of our favorites from this caravan. We could hike for days and days, never hiking the same trail. The mass transit is fantastic, totally eliminating any need to use our truck in the park or nearby Springdale while staying there. The Angels Landing trail was a big challenge for both of us. First we hiked upward four and a half miles. The remaining half mile is along a narrow rock spine and face and hikers are guided by heavy chains anchored into the rock face. We lasted all but the last 1/4 mile of the 1,488 foot hike. Maybe another time, maybe not. 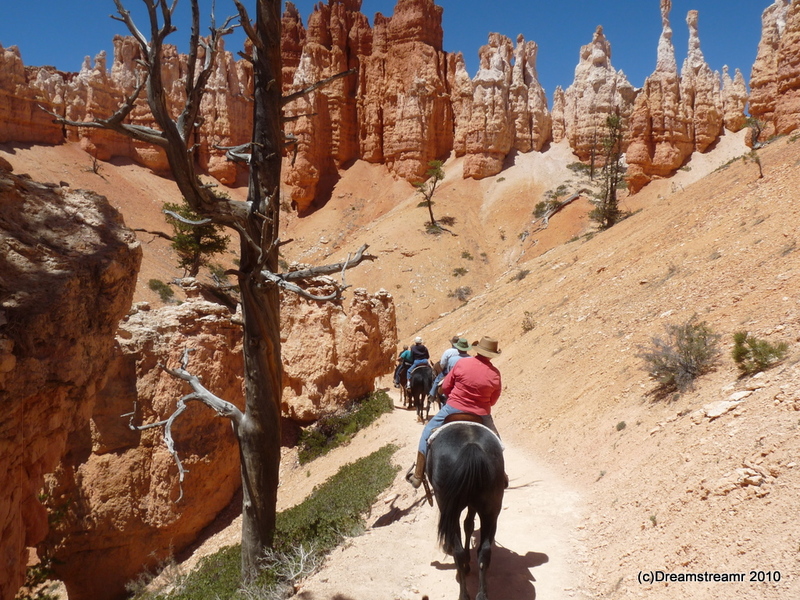 Bryce Canyon National Park, UT, is best seen walking or on horseback instead of from lookout platforms. Our trail ride into the canyon was fabulous, better than we could have dreamed. Our animals, of course, knew every step of the trail and could hardly have cared whether we were on board or not. This makes the trail ride easier for the riders — just hang on and let the mule or horse pace along behind his buddy. This is some really old log book, carved in stone! Capital Reef National Park, in Torrey, UT, is a surprise. It just doesn’t seem like it can offer very much but every turn reveals another significant settler’s cabin or archaeological feature. Or, the Pioneers’ Register in Capitol Gorge. This was the main passage into Capitol Gorge until the 1960s (when the highway was built). 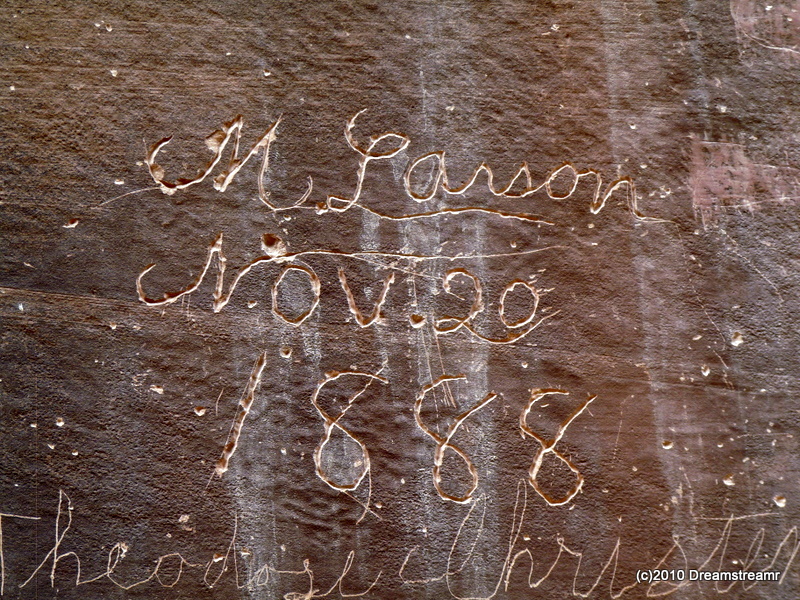 The settlers engraved their names in the sandstone above the wagon trail over one-hundred years ago. Isn’t it interesting they carved in cursive? 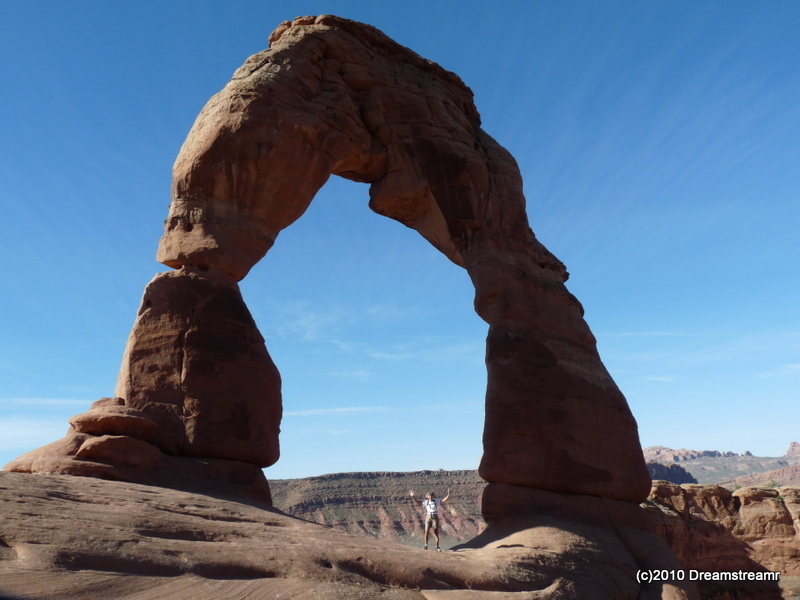 Can you see little Debbie under the Delicate Arch? Delicate Arch, Moab, UT, is one of those must-see monuments in Arches National Park. It, and Landscape Arch, and Dark Angel, and Double O, and another dozen or so occupied our hiking energies for two days. We divided our hiking time between Arches NP and Canyonlands NP, where we hiked to the lookout for the Upheaval Dome. Very very interesting. Our caravan’s last hurrah was at the Sunset Grill in Moab, UT. The food was good, and the entertainment was fantastic. Our caravan’s music makers had practiced for days, and several characters created scripts and worked on their spiels. The result? 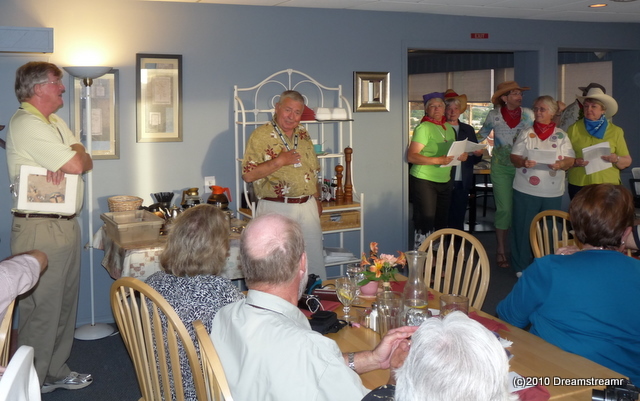 A fun finale and fitting closing to this successful caravan led by Jay and Elna Thompson and Winston and Carol Montague — Thanks for putting on such a fine caravan! Colorado is cool! We had a really nice visit here, albeit insufficient days again. We spent our first of two days walking all about downtown, visiting the Durango Diner for lunch, visiting the Chevy dealer for an engine oil filter change (have we really driven 3,000 miles already in one month? ), and exploring a couple of shops. 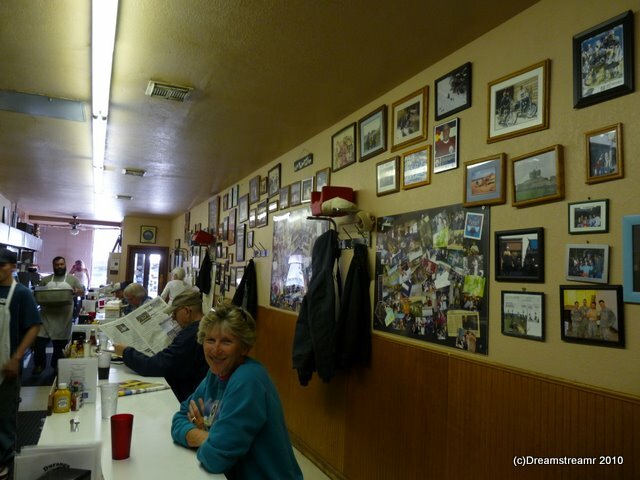 Durango Diner is another of Stern’s Road Food recommendations. We trustingly ordered the green chili cheeseburger. What a great sandwich! Immediately we realized we would not be picking this one up with our hands. The sandwich was tasty and the staff were all very friendly and fun. And, we didn’t need to eat again for two days, although we probably found our way to another table the next day anyhow. Our second day started early to board the Durango and Silverton Narrow Gauge train for Silverton, CO. Our entire caravan group seated on two open cars for the three hour ride from Durango to Silverton. Many of us had not ridden a train in a very long while, if ever, so this was an interesting experience. This train line has operated continuously since 1881 between Durango and Silverton, and has seen a lot of history, eh? Another sight from this train is fantastic scenery. Gosh, Colorado is very pretty, and so green after spending a week or two in New Mexico. We like Colorado, at least this part of it. 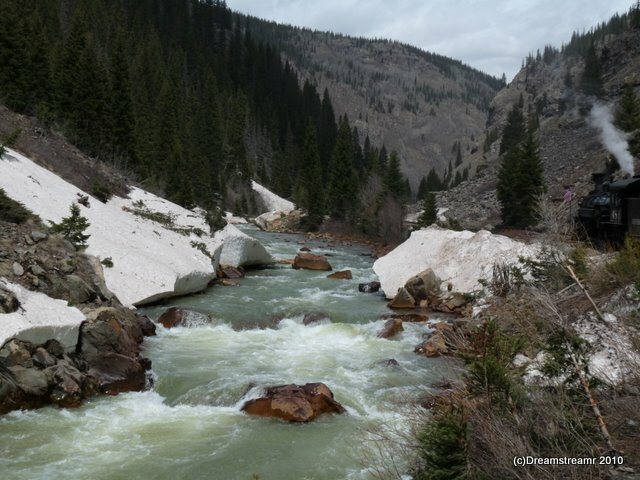 The Animas River is full of snow melt and accompanied us our entire journey. Above 8,000 feet we encountered more frequent snow drifts along the river’s banks. The snow-capped mountains towered high above us, even when we were well above the river’s course. 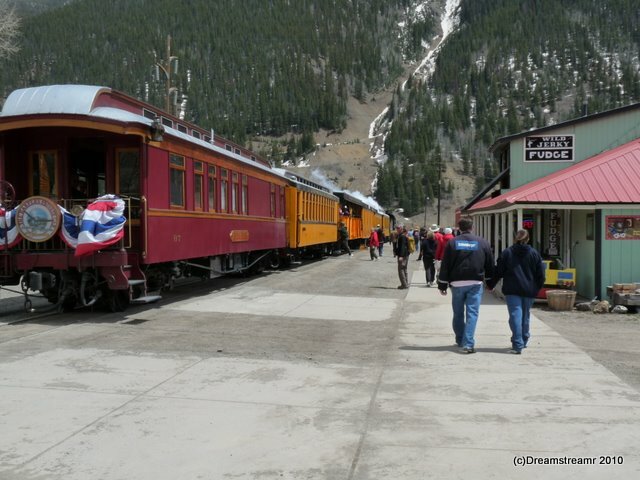 The train travels a leisurely 12 to 15 mph as it climbs from Durango to Silverton. We merrily rocked back and forth on the closely-spaced narrow gauge rails. Our positions in the open car allowed us excellent views of the beautiful scenery and of the old coal-fired steam locomotive blasting it’s steam sideways, pouring it’s condensate on the gravel bed, and shooting the sulphurous exhaust skyward. We found ourselves imagining this same trip up these rails 100 years ago (lots of info about this train here). Our train arrived one car short in Silverton. Our train crew elected to drop off one car on a siding in Rockwood, midway up the tracks between Durango and Silverton. They advised us the car had some sort of brakes problem and their best solution was to drop the car. The train crew completed this unhitching and re-hitching maneuver faster than we can unhitch and hitch our RVs. Pretty slick crew in this company! Silverton was throbbing with excitement! This is the first train arrival of the year. Not since last fall has the train brought visitors up from the city. New money, shoppers hunting bargains, and all the passengers will expect to find a good meal during their two-hour layover. The entire town turned out for our arrival, many of them in Victorian garb. Fortunately, the weather guessers were wrong again — their forecast was for a high temperature of 31 degrees F in Silverton. Silverton’s weather was instead very pleasant for walking and touring. 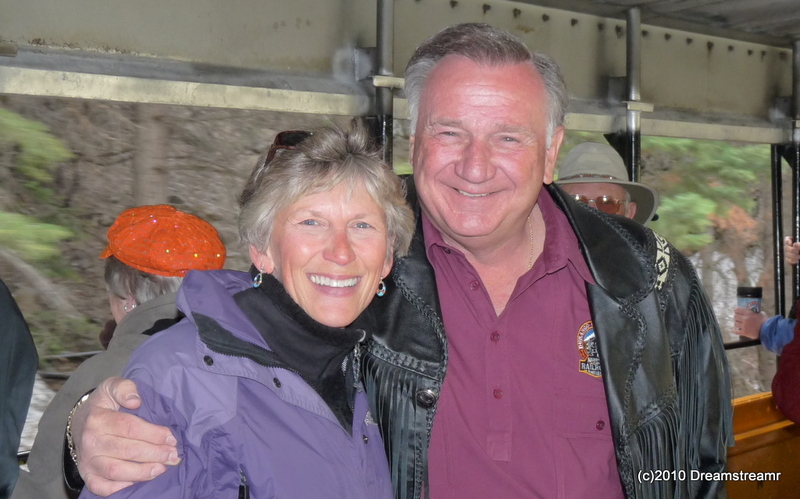 Debbie and I veered away from the throng of people to walk about the town of Silverton. We walked many blocks of the residential area, finding some fixer-upper specials on sale and a few charming little houses very well kept. We learned the town only supports 200 people over the winter, and a little over three times as many through the summer, not including up to ten thousand daily visitors during July 4 weekend. 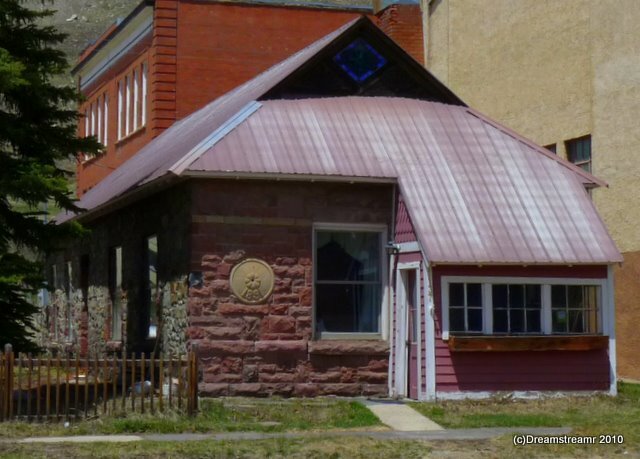 What employment opportunities are in Silverton? Mostly catering to the tourist trade, the town supports many wait staff and retail store personnel. And they were plainly glad to see us. 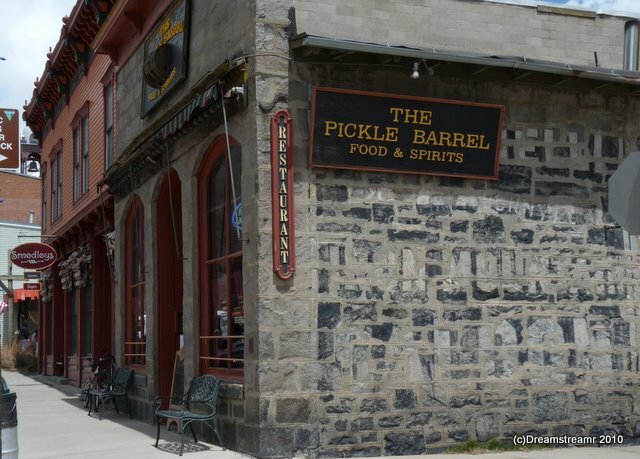 Our meal at Pickle Barrel was delightfully tasty and wholesome. We had an interesting and very good carrot and sweet potato soup, followed by a green salad, and a pair of divine desserts. Debbie’s was a chocolate and peanut butter silk pie, and it was really smooth as silk. Mine is a four-layer chocolate cake with a mousse between the layers and fudge icing on the outside. It is not four layers, but five. And no, I haven’t lost control of my verb tenses — the cake survives, still in the present tense. Debbie let me sample her pie, and she helped me a little with my cake. And I still brought half of the cake home with me. I’m looking forward to eating it again, and I think I may finish it this time. I’ve never seen a larger, or richer, slice of cake. We would eat at Pickle Barrel again anytime. The food and service were wonderful. 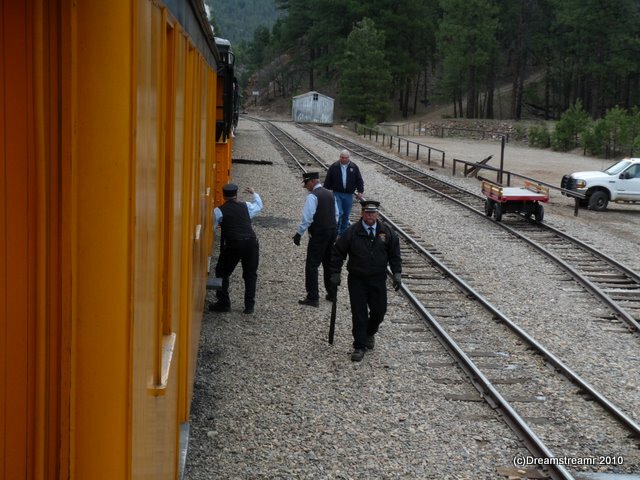 We waddled back to the train for our descent to Durango. Some of us nodded off and on as we jostled down the narrow tracks. The day was wonderful, exciting, and satisfying. Our train ride took us from 6500 feet up to 9,300 feet. The weather was glorious all day. Our train car was not left on a siding in the middle of nowhere. We had a very nice walk and a great meal in Silverton. And we returned home safely. 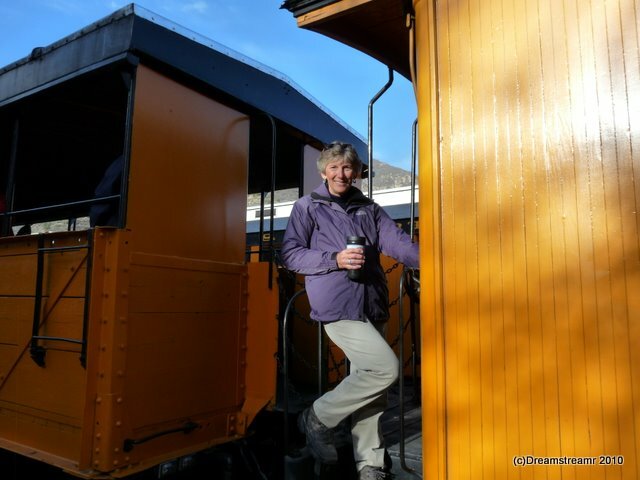 The D & SNG train ride might have excited us as much as it did Silverton, and there was plenty of excitement in the brisk air. Maybe it just goes with the territory. How much better can things be? 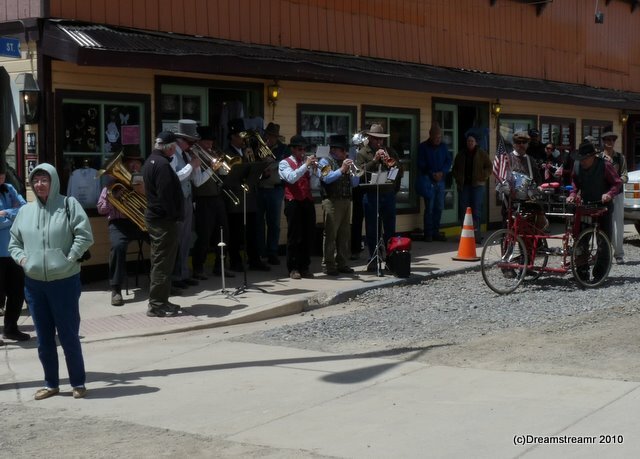 Spring is really sprung, festivals are happening in Durango. 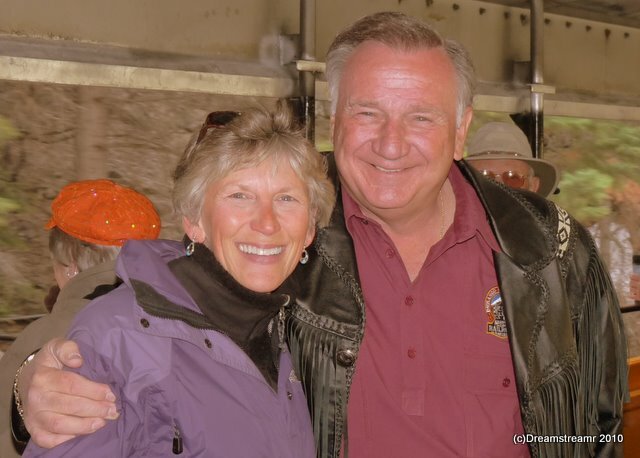 Silverton celebrated this year’s first day of visitors arriving on the train. Even Big Al Harper, D & SNG’s owner arrived in his private rail car. And we were there.